“Come!” insists the monk, “Come!” He grabs my arm and pulls me through the crowd of pilgrims towards the huge pedestal supporting the holiest Buddha in Mandalay, the Mahamuni Buddha. He charges through the praying disciples, a monk with a mission, namely to get me and Thomas up onto the elevated platform. Myanmar monks scare me. One week in this country has taught me that encounters with monks come at a cost. In a nation filled with some of the most generous people on the planet, it has become clear that materialists head straight for monkhood, Buddha be damned. “It’s OK,” I answer hesitatingly, “I’ll just stay down here.” Reflex causes me to glance up at the phenomenal site. The monk immediately detects my weakness and goes in for the kill. Shoot, that slip is going to cost me for sure. Using both hands, the monk ushers Thomas and me up the narrow stairs onto the pedestal. Now, we’re trapped on the overhanging ledge. Dozens of devout Buddhists stare up at us, or rather, at what’s behind us. 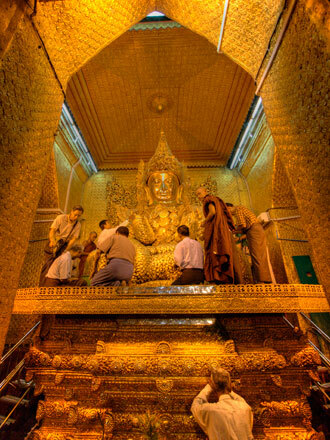 It’s stunning, a simple bronze Buddha long devoured by devotion, a statue drowning in a million tiny, stamp-sized pieces of gold leaf. Buddha’s thin legs have evolved into amorphous lumps. The flow of gold appears to be growing before me as hands appear from nowhere and press more of the shiny, yellow squares onto the object of their devotion. “Gold!” insists the monk, “Gold!” From beneath his robes, he produces a packet of gold leaf and forces it into my hands. “No, no,” I plead, terrified of what I will be expected to cough up for gold leaf. I think back to last night’s news story about gold prices being at an all-time high. Thomas looks equally worried. The monk rips open the packet for me and hands me the first leaf. Reluctantly, I press it onto Buddha’s knee. Or is it Buddha’s crotch? I can’t tell under the rolling fat folds of gold. Seriously, this Buddha looks like he’s ready for the Biggest Loser Asia. Am I going to hell for sticking my leaf into Buddha’s crotch?!? I press another gold leaf higher up onto his waist. Hey, this is kind of fun. I have suddenly lost any fear of the impending payout and given in to the thrill of gobs of gold. Thomas’ eyes indicate he is undergoing a similar transformation. 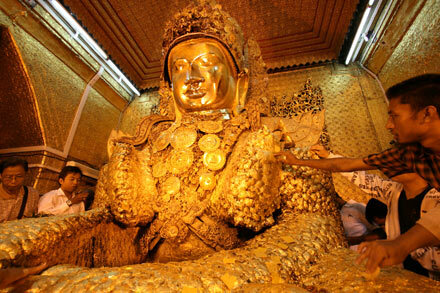 Is this the whole point of plastering Buddha with gold? Is gold fever making me Buddhist? I look down at my legs covered with tiny yellow flakes. My shirt is covered with the world’s most expensive glitter! There’s a precious metal fingerprint from the monk on the back of my hand. As I struggle to change lenses, I worry about getting gold inside my camera. It’s everywhere. The walls are gold, the ceiling is gold, there’s gold in my hair, gold, gold, gold, gold. And, suddenly, the monk drags us both from the pedestal smashing holes into our auric bliss. I think I almost achieved nirvana… in the Paris Hilton sense of the word, of course. “Donation,” the monks states, suddenly all business. In a preemptive strike, Thomas steps forward and hands him 3000 Kyat, around three dollars. 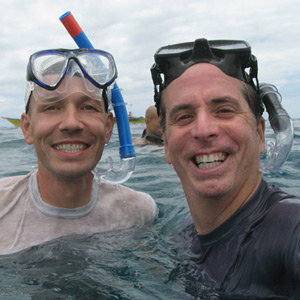 We both hold our breath anticipating a demand for $30 – or worse $300! The monk eyes the money contemplating the amount. “Thank you,” he says and off he goes in search of his next foreigner. In a gilded daze, I realize that this is one of the coolest things I’ve done in some time. Perhaps, the business monks aren’t so bad after all.